This is the replacement guide for the carriage drive chain. Check your guides periodically for wear; if overly worn, the chain will wear the heads off the mounting bolts, making removal of the bolts and guide quite difficult; the chain may also begin to wear into the frame of the saw carriage and machine base, decreasing the life of the chain. Chain guides experience increased wear when the chain tension is too loose. Be certain to check your chain tension monthly and adjust as necessary. If you find the need to tighten the chain every month, this is usually a sign that the chain needs replacement. When replacing the chain and guides, inspect the condition of the drive and idle sprockets, and also the tensioning spring. Contact me to order a new chain and guides and to schedule a visit for installation. 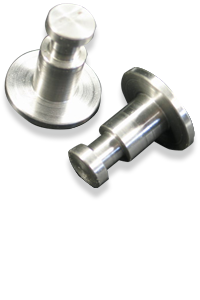 Through normal use, the quick-release hubs pins can become worn. 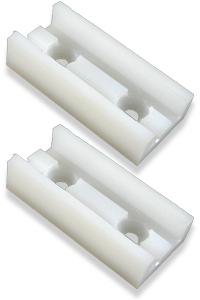 These pins are critical to the cut quality and blade life as they help ensure that the blade is firmly clamped between the arbor and quick-release flange. There have been a few different OEM versions of this pin; my pin is found predominantly on modern Prismatic, Formula, X3000, Y3000, Master, and Sigmatic machines. The newer models also use this same pin for the scoring saw hub. Please check your Giben parts manual to ensure that the correct part number is ordered. When replacing the pins it is a good idea to replace the spring washers at the same time. I recommend obtaining the spring washers from Giben. Price reduction on the hub pins, now just $35 each.